In December I discovered Tindie.com, an electronics market that’s a mix of Etsy and Kickstarter. [skip ahead if you’re a Tindie regular.] The majority of the listings are existing, finished boards, but to me the Fundraiser projects are the most intesting. With the rise of small-batch PCB service, there is a large and growing hobby electronics audience, full of projects which need a fairly minimal critical mass to get small production batches of boards printed and assembled. The project funding goals are typically under $1000, and changes to Kickstarter’s rules disallow projects which are at the CAD stage, so Tindie.com launched specifically to serve this market. And so far they’re doing a great job, at least from my experience as a buyer. I’ve backed half a dozen projects so far, and while a few haven’t reached their targets, I’ve received some awesome little boards. 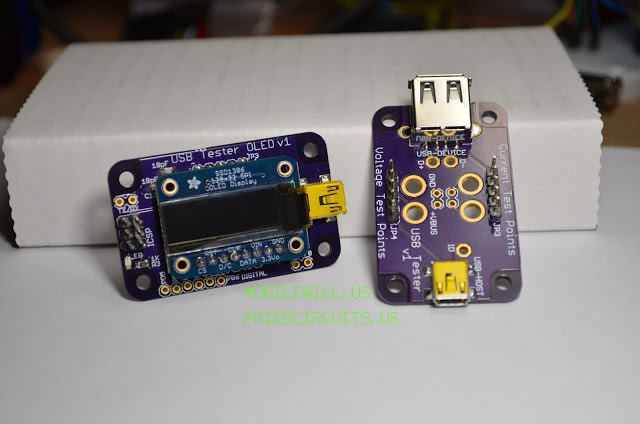 One of the first projects I backed is this USB Tester breakout board from FriedCircuits. 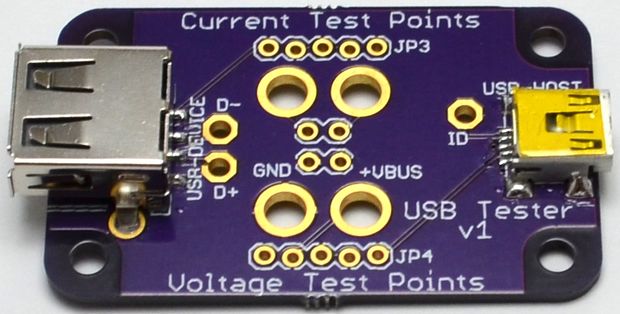 This board exposes a bunch of test points inline between a USB host and device, allowing you to measure voltage served by the host and current drawn by the device. This is a nice solid breakout board in 50mm x 31mm with nice big contact surfaces and mounting holes. You can add an acrylic base for $3 plus shipping from China. The main test points in the center are designed to accomodate banana plugs from your multimeter (the listing page points to these cables on SparkFun) but headers are also provided for access to the power and data lines. The jumper in the center allows you to choose between measuring voltage (using the lower set of test points) or current (using the upper set). Leave the jumper on for testing voltage, and remove it for current measurement. As an electronics n00b I needed a bit more help getting started than the documentation at FriedCircuits provided, but William was very helpful via email. It turns out that my multimeter has different connection points for voltage and current! I installed both sets of headers on the board, but in the end I have only found the voltage side headers useful. In fact, you will most likely be happy with only the current bypass jumper header if you’re using the banana terminals–you really only need the 1x5 jumper on the voltage side for the 0.1” form factor. 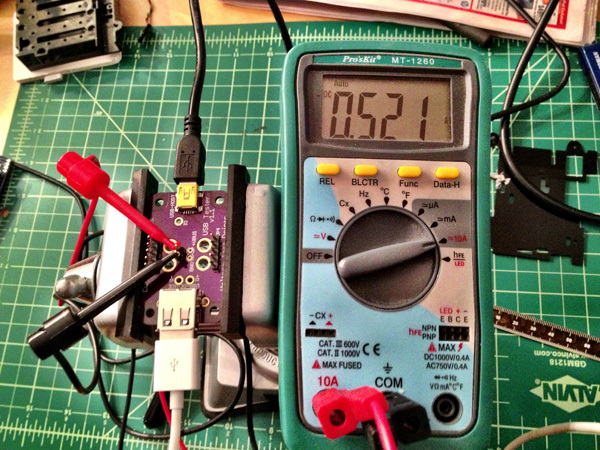 Here’s a shot of the USB Tester in action. The iPhone used to take the picture is connected via USB, drawing 521mA. NB: this is not the intended wiring for the USB Tester; The big banana plug test points on the board were hard to get a solid grip on with these IC hooks. I’ve got a pair of banana plug cables on order. Since launch, William has announced an LCD display adapter for the USB Tester which will allow you to use it directly without a multimeter. I’m looking forward to checking this out, partly for the convenience and partly because I’m working on projects using similar displays, and I’d like to learn from William’s design.